Rent Larimore House Plantation | Corporate Events | Wedding Locations, Event Spaces and Party Venues. Welcome to the Larimore House Plantation, a Victorian Estate developed before the Civil War and now a Historic Landmark and absolute favorite wedding venue in St. Louis, Missouri. 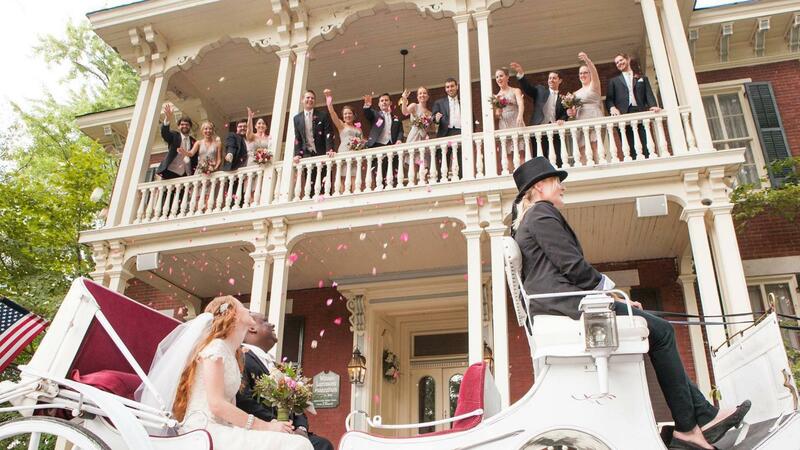 Your Wedding and/or Reception has sole use of 6 acres of estate grounds, historic mansion and elegant banquet facility. Garden Wedding Ceremonies feature the Marble Gazebo as a dazzling centerpiece, seating for up to 250 guests, and an outdoor sound system for soloists, musicians, etc. In case of inclement weather, your ceremony can be conveniently moved to our Indoor Chapel. Your reception banquet is elaborately prepared on-site and served hot and fresh. You can pick from several menu packages, to meet your needs and tastes. The Larimore House Plantation was a historic landmark in the St. Louis area during the mid to late 1800's. It's owner, Wilson Larimore, farmed all 2000 acres using the latest technology for its day: the steam engine tractor. Today, it is a recognized historic landmark and a centerpiece of St. Louis County's historic preservation areas. While it is nestled in a calm residential area, The Larimore House Plantation is convenient to major highways and an easy drive from many parts of Missouri and Illinois.